The event – A major trauma team resuscitation, multiple stabbing to chest and abdo. The patient has arrived and you’re just about to head to CT.
Do you treat all your patients well and equally? Of course you do, it is an absolute requirement of a doctor to treat all before them without prejudice or preference and such qualities are enshrined in the regulators guidance. Below is the relevant section of the GMC Good Medical Practice document that outlines how the clinical need of our patients is the most important element in deciding who to treat and when. 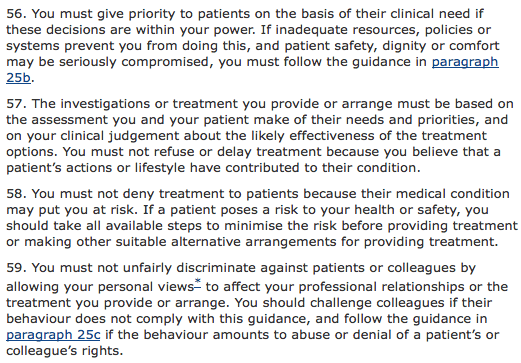 Such advice is great, it protects our right to treat patients as we assess them in terms of their clinical priority. There is no ambiguity here, the first sentence of paragraph 56 is clear and paragraph 59 states that discrimination is wrong. This is clearly something that all right minded physicians would subscribe to….., or would they? This blog is a bit risque as we tackle a subject that is a little taboo in medical circles. We ask whether everyone get the same deal in the ED and if not then why? These are not firmly held views, they are observations for discussion and reflection. We hope you find them interesting. Let’s take a rather extreme example. A certain HRH is coming to your hospital to open a shiny new build. It’s a fabulous day and all goes well. The Queen and the Duke are fantastic and the staff turn out in great numbers for what turns out to be a memorable event. As it happens I did not get to meet the Queen on this occasion (fair enough – I’ve been to a garden party which is much more exciting), and instead I was on ED duty in Virchester which is where the Queen or one of her entourage might have been brought if she had tripped and fallen. Disaster though that would have been, she would still have required treatment and so she may well have turned up in a nearby emergency department which at that time would have been rather busy. Would she have booked in to see the triage nurse? Er – No. Would she have waited in turn to see a clinician in triage and time order? Er – No. Would she have been seen by the most senior consultants in the hospital regardless of the severity of her complaint? Er – Yes! This extreme example shows how we do accept that some people get a better (different anyway – see below) deal than others when they attend the ED. If it’s the Queen or the Prime Minister then I think this would not surprise most people. They may not agree with it, and I am making no moral judgements here, but they would accept that this happens. Having said that it is a fairly extreme example and in reality very carefully laid plans are made for something as important as a royal visit (and it’s not worth boring you with the details here). 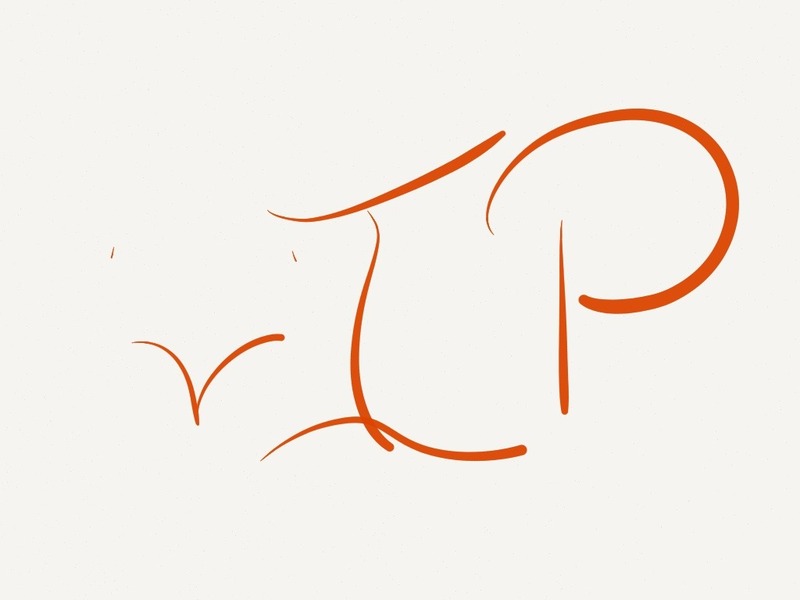 I think most people will recognise this sort of VIP, this it the VIP with a big V as in VERY. It might be difficult to define and we can debate where the line is, but I’d describe it as the sort of patient that by treating you might end up on the front page of the Virchester Evening News. So we know what we mean when we talk about the VIP with a big V, but what about the small v, the vIP, what are they and what if anything is the problem with the vIP with a small ‘v’. The vIP is a common occurrence in the ED and it’s an issue that usually falls at the feet of the most senior doctor or nurse on duty. It’s potentially a problem both for us and for our patients and so worthy of thought in the world of #FOAMed. Let’s consider some more realistic & common scenarios. 1. The senior nurse on duty receives a phone call from one of the exec secretaries. The Director of Corporate stationary has fallen over in Exec towers and twisted his ankle. He is on his way down now – they have asked if one of the consultants can see them straight away as there is an important meeting this afternoon. 2. You are on duty in PED. A colleague phones you to say that his daughter (aged 5) has a temperature and sounds a bit wheezy. She is on her way to hospital with mum and he’d be grateful if you could have a look. He will come in later when he’s finished a list at the Golden Nugget General Hospital (private list). 3. Reception calls and tells you that John Smith (the Olympic Gold medal cyclist) has been booked in following a fall in training and complaining of rib pain. Do you want to see him straight away? 4. You walk into the waiting room and see a famous celebrity waiting for triage. They are being accosted by an intoxicated man who is telling everyone who he is and how great he thinks his Saturday night show is. 5. One of your non-medical friends phones you and tells you that they are on their way into ED with their wife who has had abdominal pain for months. You do know about this and have previously advised them to see the GP. They tell you their GP is useless and has told them that it is irritable bowel syndrome, but they are really worried. Could you possibly have a look at them just to make sure that nothing has been missed. Well, it’s a very Important Person of course, but that’s not the same as a Vip, such as the Queen. I’m referring to people attending the ED where there is an expectation by themselves, or by the attending staff that they will be treated differently. The examples above show that it’s a bit of a mixed bag really, but comprises of staff members and their families, celebrities and other ‘high-risk’ patients. I’ve been contacted about issues similar to the above many times and on average I think I get a vIP once or twice a week, with staff members being by far the most common. 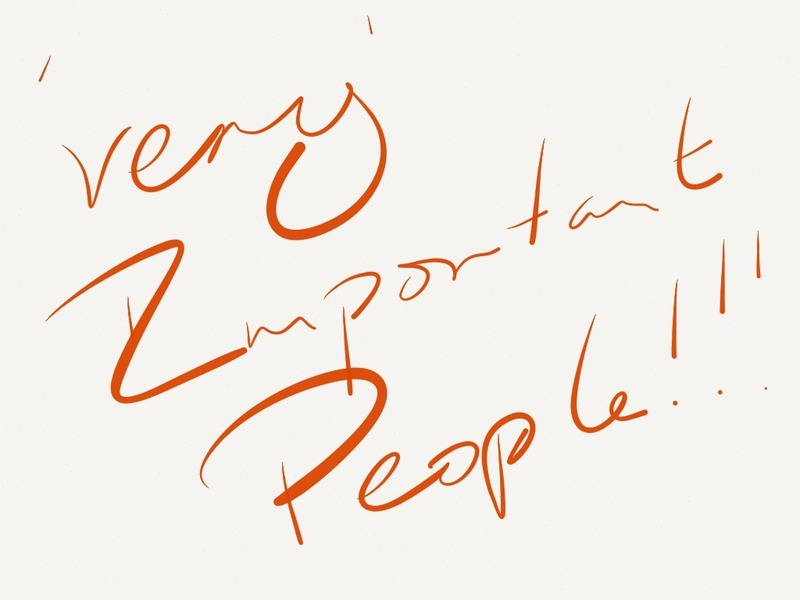 Sometimes you, or a colleague might spot them in the crowd, sometimes they will declare themselves to staff and sometimes others will phone in on their behalf, but through whatever mechanism that exists you will at some point be asked to see them and the likelihood increases the more senior you get. As a consultant you may even be phoned when off duty and at home to ‘facilitate’ the movement of vIPs into hospital. Do ‘you’ treat vIPs differently? Well you might. The differences may be subtle and overall they may make little difference to patient care, but just have a think about the following and see of any of them look familiar to you. A staff member is put to the front of the queue to be seen so that they can get back to work (a ward nurse with an allergic rash is seen immediately and sent on their way with a dose of Chlorpenamine). A celebrity is spotted in the waiting room. They are taken out of the waiting area and placed in a cubicle even though the department is ‘going like a chippy’. A manager has an abdominal ultrasound ordered & by an inpatient physician for chronic abdominal pain. They book in to the ED for one of the docs to find & explain the result. A surgical consultant arrives in the ED with low risk chest pain. They have a normal ECG. You start to see the patient when the cardiology team arrives and directly transfers the patient to CCU. A medical consultant asks you to have a quick look at a small patch of cellulitis and to prescribe antibiotics without them having to book in. Such examples will be familiar to many who work in the ED and at first look these may appear to be reasonable adjustments to process that if we were so inclined we might be able to justify…. The staff member on the ward needs to get back to work to care for other patients, but does that give them priority over the patients in the waiting room who similarly have personal and professional responsibilities? The celebrity benefits from being moved, but that blocks a cubicle for other patients to be seen and as a result they will be seen immediately receiving a more timely and probable more senior input into their care. The manager has arrived with an investigation that might never have been performed in the ED (as it’s probably not indicated to be performed as an emergency) so managing expectation and future care will be difficult. Lastly the surgical consultant with chest pain will receive an entirely different ‘type’ of care as compared to any other patient presenting with similar signs and symptoms. It is without doubt in my mind that certain groups of patients receive different care standards as a result of who they are and not just on their clinical priority.The changes to their care are quite variable but in general we are referring to a difference in one or all of the following. This is contrast to what we read from the GMC and from what many people believe they do as clinicians and from an egalitarian viewpoint this is clearly indefensible and wrong….., but in all honesty…, so what? If there is no demonstrable harm then there is no problem, but is there? Obviously the re-ordering of patient can alter the time it takes for general members of the public to be seen and that’s not great, but are there other potential problems? A few years back I saw the son of a very senior member of our hospital. He had a minor limb injury sustained during sport which had resulted in a minor soft tissue injury. I saw and examined him as I would for any other patient (don’t think they waited long though) and in my opinion no imaging was necessary. I advised them to mobilise with NSAIDs in the same way that I would advise anyone else with a similar problem. In reality though I was torn about imaging, and not from a clinical perspective…., what if I missed a fracture? No matter how subtle and inconsequential, if it were missed in the child of such a senior person in my organisation what would be the consequences for me? With such concerns would it be have been wiser to play safe and get an X-ray? I honestly weighed this decision up for some time but in the end I did not order an X-ray, but I do remember the incident well as I discussed it with a colleague who retorted ‘Yeah, I’d treat the same, but bloody brave to not get an X-ray!’. So I’m convinced that other doctors meet similar dilemmas in their practice but I don’t hear it talked about much and whilst this is only a minor example it demonstrates how the personal feelings of the physician may lead to over-investigation of vIPs. Typically we might see examples such as…. So there is a potential for clinicians to over-investigate vIPs and perhaps that’s something that we should bear in mind as a cognitive trap when we see such patients. Now. I’m reasonably prepared to do most things to most people (at least once and as long as they consent) but we must accept that it is difficult to perform some physical examinations on vIPs. There is therefore a danger that you might miss something by skipping a step in the history or examination because it might cause embarrassment to you or your vIP patient. So why not just avoid vIPs (especially friends, family and colleagues) all together? That’s top advice there, just avoid seeing the patients you don’t want to see. That sound’s so easy. so simple and so straightforward. It’s the sort of advice that a legal team might give. If you know there may be a problem then avoid it as if you don’t then you may end up culpable. Gosh, if only life in the ED was so simple! If your vIP turns up at midday Mon-Friday then sure, find someone else to see them…., but what if it’s out of normal office hours, you’re the senior and it is kind of urgent? The situation can rapidly become impossible to avoid. Many regulators suggest avoidance as a strategy wherever possible as they recognise that a conflict of interest might arise, but that advice can be really difficult to follow in the emergency setting and to give them fair dues, they do accept this. The necessity of urgent care is most likely to arise in the ED and so it is often we emergency physicians who are faced with vIPs who have urgent conditions. As a junior doc then concerns can be passed to a senior, but if you are the consultant you are often the most senior person present. The combination of urgency and seniority means that vIPs gravitate towards you with increasing frequency as you move up the hierachy. Also known as the ‘Do you know who I am’ vIP…….. This can be a complete disaster and needs careful handling. In essence these are individuals who have an ‘expectation’ of a quicker, more in depth, more senior journey through the ED. Behaviors extend from the perfectly acceptable ‘just to let you know that I am senior nurse for ICU’ as a heads up to who they are, through to the more pushy ‘Can you get the consultant to come and see me now as I need to pick up my kids from school’ right through to the walking into resus during a trauma call and demanding that they see their son right now (with a minor injury). Basically there is a range of circumstances, personality types and behaviors that can be expressed when patient who perceive themselves as VIPs demand a different level of service with little or no regard to other workloads within the department at that time. Such events test me as a consultant and they will test you. The overwhelming temptation to tell the very badly behaved patient exactly what you think is usually best avoided if you take a long term view (see below). Usually an explanation and a clear direction as to what will happen suffices though sadly bad behavior inevitably attracts senior input and so by default they often get what they want. Similarly, post discharge difficulties may also arise. Complaints run along the following lines. I would expect that people working in the NHS are entitled to some privileges. I will of course see any of your staff at immediate notice should it be required (in my tertiary, Tues am clinic, if not on holiday, referred by your local consultant and with genotype *******). Now don’t get me wrong. These are fantastic entertainment value and I do like to share them around colleagues (as a learning moment of course), but they do illustrate the differences in expectations that may occur between departments. In the ED we are (I think) a rather more egalitarian bunch with a fairly flat hierarchy. This is not the case elsewhere and as a result a difference in expectations, and therefore satisfaction may arise. There are several ways of handling such complaints, but I find passing them on to the complaints department quite effective. It formalises the process and ensures that they receive an appropriate response (that has been seen by the Chief Exec and MD of your hospital……). Absolutely not. It is a fabulous compliment when a colleague asks you to see them, their relative or colleague. It’s a true sign of trust and respect in your abilities and an indication that people respect you as a clinician. It really is a good thing (honest). There is also the added bonus that if you treat a staff vIP well then they will be your friend for many years to come. That consultant who was a real ‘wall’ for referrals, suddenly they are your best mate and can’t do enough to help. So, there are potential long term benefits to you, your colleagues, your department and perhaps then also your future patients. Err…. Aren’t you being a bit hypocritical here??? Well yes, I am. I must admit to getting preferential treatment from colleagues when I was poorly and when members of my family were poorly. The care and attention we received was fantastic and we are truly grateful. I am therefore somewhat hypocritical in suggesting that vIPs are a problem when I have been one myself (and will probably be one again in the future) though I think my small level of insight is a principal reason for writing this post as it’s a potentially tricky situation on both sides of the encounter. We should also consider whether this is more of an issue in the ED than in other settings and in general I think it is. We see more patients, we have easier access, through the ever open door of the ED and we can and do see a very broad range of conditions. Whilst pretty much all face to face clinical specialities will deal with vIPs at some point, the frequency within the ED is probably higher than anywhere else. You can’t avoid them so think about how you are going to cope. All vIPs MUST book in as a patient and have a formal record of attendance made. Corridor consultations are potentially disastrous. Being asked to see a vIP is usually an enormous compliment, so look at the pros as well as the cons. Consider whether you can/should act as a physician to colleagues/friends/family. Is it more appropriate (and is it possible) to facilitate care than to personally provide it (i.e. get someone else competent to see the patient/vIP). Make an honest assessment of whether you are the right person to see the patient. Accept and believe that your care can be influenced by the vIP status. Ask yourself if and why your approach is affected and share your concerns with the patient/vIP. Consider departmental approaches to vIPs. If you have been asked to see someone but you feel conflicted in your approach then go and tell the patient/vIP. In my experience they understand after explanation and are happy to go with plan B (which is usually for someone else to see them from a clinical perspective). Lastly, always work with a team that you can call at any time. In my department we have a culture that means that any one of us could be phoned for advice at any time 24/7/365. There’s no shame in sharing a problem and it’s great practice to do so. I merely ask that we stop and reflect on what we’re going to do when (inevitably) the next vIP arrives in the ED. If we’re good at our job (or at least held in high regard), then it’s probably going to be you or me who is asked to see them and we should consider our approach. In general we can deliver great care by being consistent and careful with an aim to align the care of vIPs as closely as possible to that which we deliver to everyone else (that is really what should happen), but I also put it to you that there are a few moral and ethical issues that we simply cannot avoid. This is a bit of a taboo subject and one that I’ve never seen in a textbook. 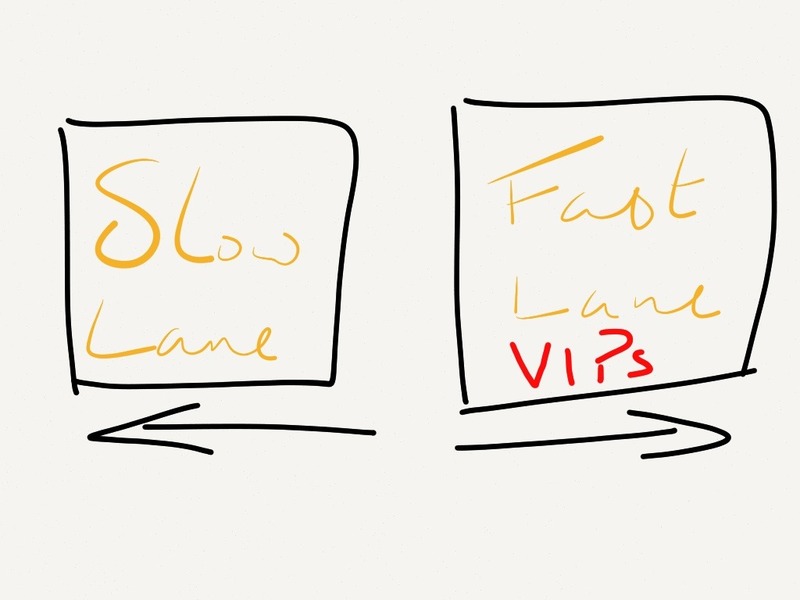 I’m really interested in your thoughts and any other strategies that you might have for dealing with vIPs. PS. If I turn up in your ED I’d be really grateful and humbled if you would look after me. Thanks. I promise to buy nice chocolates. This is a really great discussion, thanks for posting it. As you mentioned, there seems to be a taboo around this topic and as a result I think doctors (particularly junior docs) often may bow to pressure to ‘quickly see someone’ and may not have an approach to these types of patients. They MUST open a folder and be triaged as per any other patient. I dont do ‘corridor consults’ and when I explain this in terms of medico legal risk, most people understand. I do try and expedite seeing patients who work in the hospital and generally will see them myself – mainly in terms of doing an appropriate workup and making a relatively quick decision as to ‘back to work’ or ‘booked off’. Once I have seen them and made that decision I phone their superior myself so they are in the loop as to what is happening. However I always explain that the other parts of the EC/hospital stay are completely out of my control – eg waiting for an Xray/CT scan or a bed in a ward. We do not allow interns to see staff members with ‘Injuries on duty’ – in the past they have often been manipulated into doing unneccessary things in the EC. I will first attend to sick/critically ill patients and then only to the staff member who may not be as critical. This is also explained to them upfront, with an estimated waiting time. Staff patients with non urgent problems who present inappropriately at the EC are re directed like any other patient. Last night I had the security guard asking for a refill of her contraceptive pill script – this type of things drives me nuts but I simply defer them to the correct facility. I personally dont see any family members or close friends (unless they were pulseless) – What we were taught in medical school echoes what you said above – if you are not prepared to do a rectal/PV/genital exam on this person, you probably shouldnt be treating them. I generally defer them to an another appropriate physician. It has taken me approx 8 years and many, many mistakes to get to the point where I am confortable with dealing with “vips”. I suppose confidence in my own clinical ability has also grown over time and that does help. Thanks so much for your comments. I agree with all that you say, though I have to admit to being a slower learner than you. It’s taken me more than 8 years to get there (and a few mistakes along the way). What about the other side of the coin, when the vIP is given the “You will have the exact same experience as everyone else here” treatment, or worse, as a political statement, especially if the department is busy/understaffed/underfunded? VIP treatment is something that occurs in the out of hospital setting (as well as every other I assume) and I had not thought about it until I was confronted by it. Anne, I really like your mix of professional courtesy and systems approach to ensure even your vIP’s are given equitable treatment and the protection of the junior staff. Excellent example of leadership. My intuitive reaction was that I hardly ever experience this problem any longer, so I had to stop and think for a while, which is of course what every good blog post should lead to. I don’t think we see a lot of people claiming to be VIPs eg a business manager or even someone from in-house. It is not socially accepted to say that you are more important than other patients because of your social status. A politician could definitely not expect special treatment. It does happen sometimes that doctors from the hospital bring in friends or relatives, but they usually see them themselves, since all doctors in the hospital regularly work in the ED. I would be surprised if someone tried to bypass the queue for something that wasn’t an emergency. Or a at least perceived by them as such. I try to keep in mind that all patients and their families can behave strangely when they are under stress. Even if we are usually sensible doctors or nurses, the transformation to being a patient makes us think and function differently. All patients who come to the ED deserve to have their privacy respected and for someone who is recognized by others in the waiting room, I do think it is appropriate to offer them a room. I would probably also try to limit the number of people involved in that person’s care. We deal with risks all the time. The risk for breach of confidentiality is higher in theses patients, thus we take more precautions. I wouldn’t necessarily call this special treatment, like any other treatment it is adapted to the patient’s needs and special circumstances. Co-workers asking for consultations used to be a problem. We now have a policy that everyone has to register and go through the usual pathway and that has reduced the requests for various prescriptions. If someone asks it is great to be able to say that you’d love to help, but that it is not allowed.